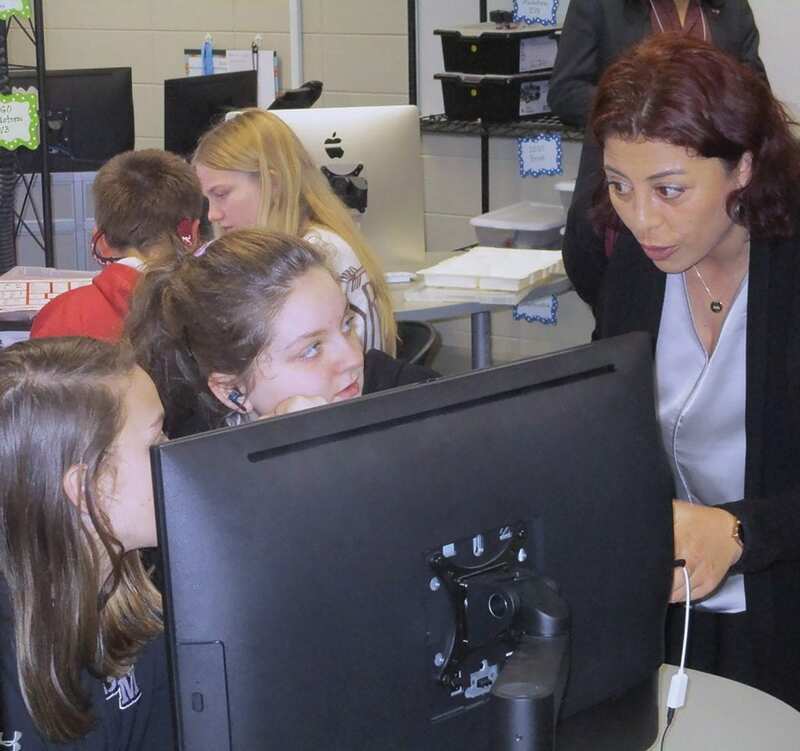 Arzu Atasoy (right), director of Education Academy Foundation in Turkey, observes students in Susan Moore’s STEAM lab. International educators and Alabama hosts visited the Susan Moore High School STEAM Lab last week. Visitors, representing several different countries, circulated among the dozen multi-student stations observing and talking to the student teams – then conferring with each other – about their projects. From talking to participants, most are familiar with basic concepts underlying applications like the STEAM lab, which encourages creative, individually-focused learning with emphasis on problem solving in groups with its attendant emphasis on communication and collaboration in a software-rich environment. A common – though not universal – theme among the countries/education systems represented was that their private schools are keeping well abreast of changes in technology, while public systems struggle with inadequate funding for technology – and some with adequate resources for basic educational infrastructure like buildings and books – to educate the masses. A surprising indication from one participant was that private schools in her country are required in small ways to subsidize technology for the public system. From left: Dennis Engle, AMSTI (Alabama Math, Science, and Technology Initiative) assistant director, Athens State University; Arzu Atasoy, director, Education Academy Foundation (Turkey); Mike Stansberry, Susan Moore High School principal; Robyn Clark, head of Research and Innovation for Math Education (South Africa); Bijaya Shrestha, director, Deerwalk Institute of Technology (Nepal); Hassen Rached, language inspector and teacher trainer, Tunisia Ministry of Education; Bastian Esquivel, director STEM Academy (Chile); Titus Tokpah, executive director, media trainer, and lecturer, MediaAid Foundation (Liberia); Jennifer Priest, Susan Moore STEAM Lab facilitator; Carrie Lin, AMSTI director, Athens State University; and Bridgette Murphree, Blount County Schools elementary curriculum coordinator. The group had visited Huntsville City Schools, Drake State Community College, New Century Technology High School (Huntsville), New Market Elementary School, the U.S. Space and Rocket Center, and Hudson Alpha Biotechnology Center, with the Susan Moore STEAM Lab being the last stop to observe new initiatives to teach math, science, and engineering in rural areas of Alabama. The theme of the tour was “Education in a Digital Age,” sponsored by the U. S. Department of State International Visitor Leadership Program, assisted with local arrangments by Global Ties Alabama, an international exchange organization headquartered in Huntsville.